During the cold and bitter winter weather, I have been using three of my favorite body butters to keep my hands and arms moisturized. They are all-natural and full of healthy ingredients to revitalize your skin! The first raw body butter that I’ve ever tried is Raw Shea Butter from Shea Moisture, one of my favorite hair brands. Along with Vitamin E, it's infused with frankincense and myrrh, (the two oils Jesus was gifted with!). The thick consistency has been perfect for moisturizing my elbows whenever they get slightly cracked. Along with the raw butter’s hydrating benefits, it’s also nice to know that purchasing it will benefit women-led businesses in Northern Ghana by helping to fund their training and get fairer prices for their goods and labor. (Most shea butter companies will buy all of the shea nuts for rock-bottom prices before anyone else can have the opportunity to use them, watch this video for more information). I always aim for products that give to a good cause which is why I’ve been using Shea Moisture for most of my hair and body-related products! The next body butter is from Sunrise Mountain, a soap company founded by my aunt and uncle. Their business is committed to providing natural products with the highest-quality ingredients available. This moisturizing body butter is made with shea, mango, and cocoa butter as well as carrot oil, borage oil and tangerine essential oil. As a person who isn’t fond of strong-smelling products, I adore the mild fruity scent of it. The butter has a light consistency which readily absorbs into the skin, and I like to keep it in my purse and use for whenever my hands need some moisture. Some of my favorite handmade soap bars from their collection are the lavender and sweet orange scents. If you also love to use natural and handmade soap, you can find many different varieties on their website at sunrisemountainsoap.com. 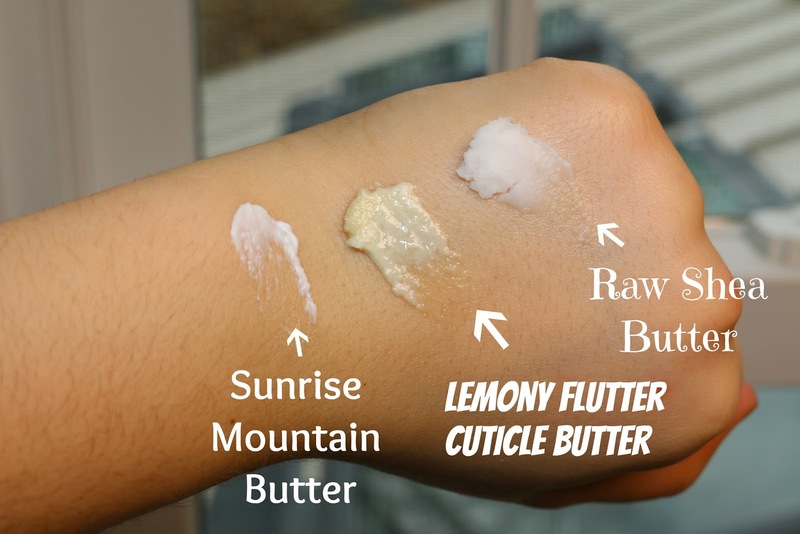 For those of you who adore Lush products, I have been using the Lemony Flutter Cuticle Butter for over a year now and enjoy the lemony waft that comes out of the pot whenever I open it. The mango butter and coconut oil are good for hydration and the lavender oil helps to heal wounds and restore skin complexion which is perfect for targeting cuticles. These are the three body butters that I have been using for the past few months. If you also have any recommendations for natural, organic body butters, feel free to share them in the comments below!